SAN JUAN, Puerto Rico — Hurricane Maria killed far more people in Puerto Rico than initially thought, accounting for an estimated 2,975 deaths on the island from September 2017 through February 2018, according to a new analysis. The study found that those in low-income areas, and elderly men, were at greatest risk of dying. The independent analysis was commissioned by the governor of Puerto Rico and conducted by researchers at George Washington University's Milken Institute School of Public Health. CBS News obtained a report on the findings from Carlos Mercader, executive director of the Puerto Rico Federal Affairs Administration. "The reality is that we take this very seriously," Mercader said on CBSN. "We mourn those people that died because of this storm and we have a responsibility of making sure that we prepare Puerto Rico for a future event like this," he said. 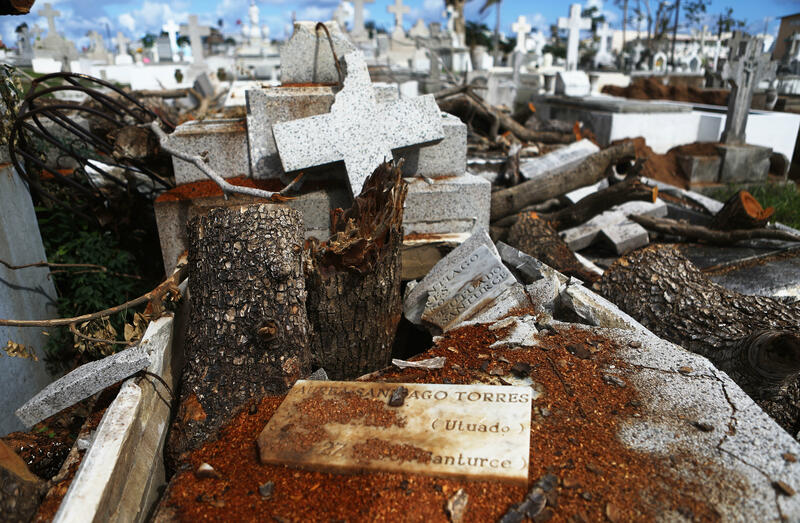 To arrive at the 2,975 figure, the study looked at historical death patterns from 2010 to 2017 to estimate how many people would have died had Hurricane Maria not hit the island. That figure was then compared to the actual number of deaths from September 2017 through February 2018 — obtained in records provided by the Puerto Rico Vital Statistics Records division of the Puerto Rico Department of Health — to determine what the report describes as the "estimate of excess mortality due to the hurricane." The study found that while all age groups and social strata were affected by the hurricane, the risk of death was "45% higher and persistent until the end of the study period for populations living in low socioeconomic development municipalities." It also found that men age 65 and older were at heightened risk of death through February, the end of the study period. "Overall, we estimate that 40% of municipalities experienced significantly higher mortality in the study period than in the comparable period of the previous two years," the report says. In the aftermath of the devastating storm, which barreled into Puerto Rico last September, Puerto Rico's government initially reported 64 deaths blamed on the hurricane. Since then, several studies have indicated the actual death toll was much higher, though researchers have arrived at a range of different figures. In May, a Harvard University study said Maria was likely responsible for more than 4,600 deaths from the day of the storm, September 20, until December 31, 2017 — a figure that was based on results of a door-to-door survey of 3,299 randomly selected homes across the island. Earlier this month, Puerto Rico said in a report to Congress there were 1,427 more deaths "than normal" in the four months after Hurricane Maria and Hurricane Irma, which churned on a path just north of the island two weeks before Maria hit. That report said, however, those 1,427 deaths "may or may not be attributable to the hurricanes." The latest study says that from the period ranging from September to December 2017 alone, there were an excess of 2,098 deaths, and 2,975 from September 2017 through February 2018. "2,975 — it's 2,975 people who suffered," Mercader said. By comparison, at least 1,833 people died as a result of Hurricane Katrina, which hit in the U.S. Gulf Coast and caused devastating flooding in New Orleans in 2005. Puerto Rico Gov. Ricardo Rosselló has accepted the findings of the report and is raising the official death from the storm from 64 to 2,975. San Juan Mayor Carmen Yulín Cruz called the report "painful and shameful." The report offered insight as to why the initial count of 64 was so much lower than this new figure. "The official government estimate of 64 deaths from the hurricane is low primarily because the conventions used for causal attribution only allowed for classification of deaths attributable directly to the storm, e.g., those caused by structural collapse, flying debris, floods and drownings," the report says. "During our broader study, we found that many physicians were not oriented in the appropriate certification protocol. This translated into an inadequate indicator for monitoring mortality in the hurricane's aftermath." The report goes on to say that "physician unawareness of appropriate death certification practices after a natural disaster and the Government of Puerto Rico's lack of communication about death certificate reporting prior to the 2017 hurricane season substantially limited the count of deaths related to Maria." The report, which analyzed processes related to death certification, says that physicians and forensic physicians are among those in Puerto Rico who are authorized to complete death certificates, but that most physicians have no formal training in how to do so. They are therefore unaware of "appropriate death certification practices, especially in a disaster setting," the report found. "Those interviewed said they did not receive information about how to certify deaths during, or in conditions created by, a disaster," the report says. It also says there was a communication problem between the Puerto Rico Vital Statistics Registry and other government agencies and those involved in the death certification and registration process. "Many stated that the Puerto Rico Department of Health (DoH) and the Puerto Rico Department of Public Safety (DPS) did not notify them about the CDC special guidelines for correct documentation of cases, on the importance of correctly documenting deaths related to the hurricane or on an emergency protocol for handling these cases," it says. The report makes various recommendations on issues including mortality surveillance and communication during natural disasters. Rosselló is expected to sign an executive order in the next 24 hours that will create a commission to implement recommendations made in the report. Mercader said that in the days after Hurricane Maria hit, "there were a lot of things that failed in their response and we take responsibility for that."